On July 30th, Fedor Emelianenko will step inside the Strikeforce cage for the 4th time in his career, this time facing the fellow MMA legend and former PRIDE Champion Dan "Hendo" Henderson at Sears Centre in Hoffman Estates, Illinois. Fedor will look to bounce back from two consecutive defeats, against Fabricio Werdum via Submission and Antonio Silva via TKO (Doctor Stoppage). The fight against Henderson will be a defining moment in Fedor Emelianenko's illustrious MMA career. One of the men behind Fedor's success as a Mixed Martial Artist, is his eternal SAMBO coach and mentor Vladimir Voronov, who trains "The Last Emperor" since the age of twelve. Voronov holds numerous honors as SAMBO specialist and coach, including the prestigious "Honoured Coach of Russia". You recently returned from the training camp in Kislovodsk, where Fedor Emelianenko continued his preparations for the fight against Dan Henderson. What was different in this training camp, comparing to the last one you had for Antonio Silva? We had a very successful training camp in Kislovodsk. There are no big differences from the previous one. Although we made some adjustments for Henderson as an opponent and to the intensity of Fedor's training. 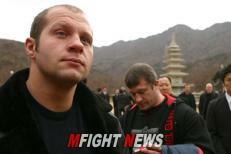 Everyone was surprised to see Fedor and Alexander Emelianenko training together. What kind of effect it had on Fedor's preparation? Well, first of all, they are brothers. Alexander wanted to train and he joined us for this camp. I consider him to be the second best Russian fighter after Fedor. And that's exactly why having him as a sparring partner was a very positive thing for Fedor. Dan Henderson is well known for his "H-Bomb", heavy right hand that knocked out many opponents throughout history. Do you consider it to be his main weapon in the fight against Fedor Emelianenko? It's hard to tell. Every fighter has his own advantages and disadvantages. That's something we'll find out only on July 30th. Henderson recently stated that he thinks Fedor has problems with motivation. What can you say about Fedor's motivation coming to this bout? Right now, he's very motivated. It's hard to say what will happen during the fight, because it all depends on Fedor. As coaches, we have done and are doing everything in our power to help Fedor reaching the peak of his physical and psychological condition. Now, everything depends on Fedor. What in your opinion is the key for victory against Dan Henderson? Many people in Mixed Martial Arts community think that Fedor should move down to 205 (93kg). Do you think Fedor will be more effective as a fighter at that weight? I can't see any sense in Fedor moving down to 205. Why would he do it? To run away from someone? I think that if Fedor returns to the previous workload, today's Heavyweights will struggle against him. The most important thing here is to have the right motivation and training regime. If you want to win, you have to play by the rules. You're training Fedor since he's 12. What can you say about his evolution as a fighter, since his first day in your gym, through PRIDE days and until today? Obviously, Fedor grew and matured a lot since his early years in the sport. There's a lot of changes, psychological and physiological. He still has the same character. Maybe he's a little tired of the sport. He trains all the time, since his childhood, and managed to maintain all his human qualities. What can you say about fighters such as Anderson Silva, Jon Jones and Cain Velasquez? All are good guys, and I hope they will keep up the good work. And about the current generation of "Russian" MMA? Alexander Shlemenko, Maxim Grishin, Guram Gugenishvili, Alexander Sarnavskiy...? They are young guys, who have a very bright future in this sport. Right now, they have to work as hard as they can. The only way to improve and to achieve success is to train hard.